2018 Vanderbilt Prize Student Scholar, Alissa Guarnaccia with Jennifer Pietenpol, PhD, and Lawrence Marnett, PhD. Congratulations to the 2018 Vanderbilt Prize Student Scholar, Alissa Guarnaccia! Alissa Guarnaccia is a member of the Interdisciplinary Graduate Program entering class of 2014 and a Ph.D. student in the laboratory of William Tansey, Ph.D., professor of Cell and Developmental Biology and Ingram Professor of Cancer Research. As the 2018 Student Scholar, Alissa will be mentored by the 2018 Vanderbilt Prize recipient, Angelika Amon, Ph.D., an internationally known scientist at the Massachusetts Institute of Technology. 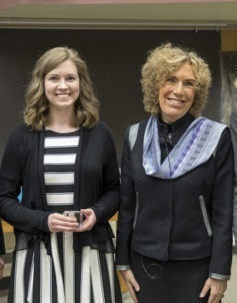 The Vanderbilt Prize Student Scholar receives a $1,000 cash prize and is afforded the distinct opportunity to be mentored for a year by the corresponding recipient of the Vanderbilt Prize in Biomedical Science – a woman scientist of national reputation who has a stellar record of research accomplishments and is known for her mentorship of women in science. Nominations are accepted from department chairs or program directors in the biomedical sciences, as well as directors of graduate studies and faculty mentors. Competitive nominees are those who demonstrate excellent leadership qualities through their research and service to the scientific community as well as characteristics that exhibit outstanding potential to impact medicine through research during their careers. Nominations for the Vanderbilt Prize Student Scholar are not currently being accepted. For questions, contact Anna Haase at anna-sofia.haase@vumc.org or 615-875-7529.